Electric fences are governed by the Electrical Machinery Regulations which are part of the Occupational Health and Safety Act. 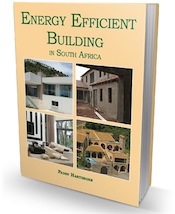 In addition, local authorities and municipalities have their own by-laws that must be complied with. You can download the Electrical Machinery Regs from the link above. Below is an explanation extracted from the City of Cape Town bylaws. Be sure to check the bylaws in your area. 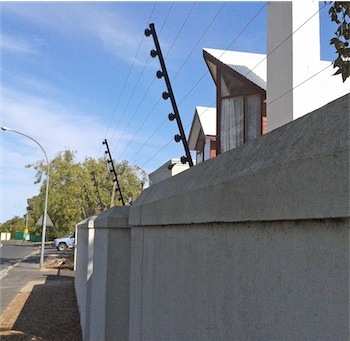 For the purposes of managing and assessing proposals in terms of the City of Cape Town’s policy, an electric fence means “an electrified barrier erected on top of a boundary wall or attached to a boundary wall or fence”. They may not be any higher than 450 mm. They must be at least 1,8 m above the level of natural ground at any point. They may only be erected on top of walls and fences, or attached to them. They may not encroach over site boundaries. Regulation 11 of the Electrical Machinery Regulations promulgated in terms of the Occupational Health and Safety Act, No 85 of 2003 must be fully complied with. Regulation 11 of the above Act gives information in terms of how electric fences operate in terms of the shock they impart. For instance, the peak value of voltage is 10 kV; the maximum duration of the electrical impulse it puts out is 50 ms; the minimum interval allowed between impulses is 0.75s; the maximum quantity of electricity per impulse allowed is 2.5 mC; and the maximum energy discharge per impulse measured at a resistance of 500 ohms is 8 J. In a nutshell, electric fences are intended to be a deterrent – not a device that will kill an intruder! “Fence energizers” shouldn’t be installed in locations where they could become a fire hazard. They shouldn’t be installed any closer than 2 m from the earth of any other electrical system. Barbed-wire should never be electrified – the idea is that a person who touches electric wiring will let go immediately. In addition, the City’s policy document states that freestanding electric fences may not be erected along any boundary in a position that would allow people to “inadvertently come into contact therewith”. Essentially the reasoning is that while electric fencing is erected to keep intruders out, it must not be erected in such a way that a passer-by could touch it accidentally. Spikes and an electric fence mounted on top of a street facing wall. For the purposes of managing and assessing proposals in terms of the policy, security devices include a variety of devices – security spikes, razor wire and barbed wire affixed to, or on the top of walls or fences. 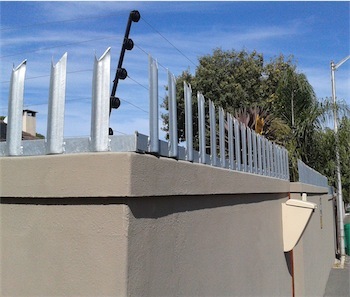 Security spikes are permitted on top of boundary walls as long as they are affixed at least 1,8m above the footway (usually a pavement or kerb). Security spikes may not encroach over the site boundary. Razor and barbed wire is not permitted in any form in residential-zoned and commercial-zoned areas. They may be used in areas that are zoned industrial. Glass shards are not permitted in any form in residential areas. Freestanding electric fences that are set back by at least 1 metre from the boundary. Electric fences and spikes are permitted on top of walls and fences. Barbed wire, unless the Council is satisfied that the property is being used for bona fide farming purposes (which clearly wouldn’t be the case in a residential area). Off-cut, untreated split-pole or sapwood timber (laths or latte) of any kind. These are the boundaries between you and neighbouring properties. Freestanding electric fences must be set back by at least 1 metre from the boundary. As above except that galvanized iron sheets, razor and bared wire are allowed on both street and lateral boundaries. Prior written authority to erect a boundary wall or fence or to install an electric fence must be obtained from Council in terms of the National building Regulations and other applicable laws. Note: The local authority has the right to demand plans for walls and fences that are higher than 1,8 m.
Deviations and relaxations of the policy are permitted at the discretion of the District Manager. Any application for a deviation or relaxation must be accompanied by a full motivation including endorsement by the neighbouring property owners. So if you want to do something that is not normally allowed, your neighbour will have to agree – in writing. The same applies to your neighbour. We stay in a complex which has razor wire and electric fence all around. The razor wire needs to be replaced. Are we allowed to have razor wire and electric fence on one wall? Hi Bernice, Most municipalities do allow both but the legislation does not allow razor wire to be electrified. The regs state that a registered electric fence installer must do the work. There is more information in this article. I have a palisade fence seperating my house from my neitghbours. He decided without my permission to weld his electric fence on my palisade and now the entire palisade is electrified and shocking anybody who touches it.. is that legal? No it isn’t legal. And if the fence is actually yours (i.e. you paid for it to be erected) then he has no right to do this in terms of ownership and you can demand he removes it. In any case I would contact your local council and ask them to please do an inspection. Check with your local council Marge. Certainly in terms of the City of Cape Town’s regulations it is not. “Specifications for Electric Fences” state clearly that “They may not encroach over site boundaries,” which they will do if angled towards your garden. Can anybody assist. When selling a farm property or a smallholding that has an electric fence, is an electrical fence certificate required. In the case where just the homestead has electrical fencing around same is it necessary to obtain an EFC when selling. Many thanks. I live in a complex which is free hold , other rpoperties have extended there gardens on common ground, would I be able to erect a hedge on common ground in front of my house. I assume you would need permission from the owner of the “common ground” to do so. Our estate (in Johannesburg) has erected an electric fence from ground level on the inside of the perimeter palisade fencing. Some units (mine included) are mere meters away from the fence. I cannot seem to get a definitive answer as to whether this is legal. A boy has already been shocked by the fence. Unfortunately I only learned that the fence is from ground level after it had been erected. The information in this artical is not as correct as they state.. There are differences between municipal by-laws and actual legislation. Youre complex is wityhin its right ti put up a fence like that. The law actualy says 1.5m from the natural groung level where it is bordering a public access area. As the inside of youre boundery wall is not a public acces area they conform to legislation. Legislation as a guideline. It is very important not to mix up the bylaws and legislation. If there are any issues regarding fences you are welcome to contact me at fensec9@gmail.com. Heinrich thanks for your input. Yes there is a lot of confusion between National Legislation and By-laws but in certain cases local authorities apply their own discretion when it comes to the law.